SHANE O’Donnell wrote himself into the history books on Saturday and a child born early on Monday morning, in the most dramatic of circumstances, will bear his first name. 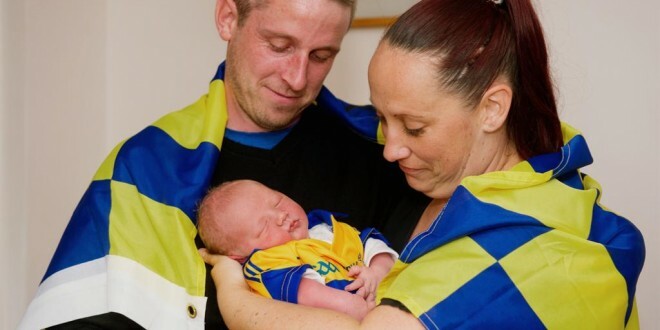 Shannon’s Laura Hinsley gave birth to her fourth child and first son at the side of the road close to the Clare-Limerick border, after a dash to the hospital didn’t quite succeed. The baby was due to arrive on Monday but Laura didn’t realise things would happen quite so fast. “I was getting pains at 12 o’clock on Sunday night after we came back from Newmarket [after welcoming the Clare team back]. Then the next morning, I told my husband we’d be going in at some stage. At nine o’clock we went out and took all the flags down from outside the house. We headed in at about twenty past nine in the morning. He was born at about twenty to ten at the side of the road. Asked if the name was inspired by the teenager who scored 3-3 on Saturday, she said “kind of, yeah”. Mark said it was “probably the most stressful morning I’ve ever had”. He got a huge shock when he was informed they wouldn’t reach the hospital in time. Having been to the births of his other children, he felt he’d be okay as long as there were no unforeseen problems.